Large-size working drawings are an elementary means in the architectural process and the actual construction of a building. 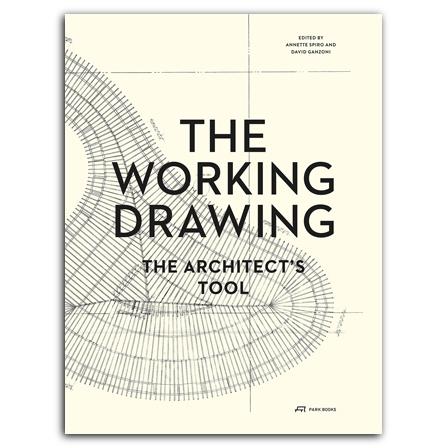 Yet very little has been written and published about the architect’s quintessential tool. This new book aims to close this gap. It draws on a vast collection of working drawings from many centuries held by the Department of Architecture at the Swiss Federal Institute of Technology Zurich (ETH Zurich). The collection, put together and categorized under the direction of Annette Spiro, comprises plans for a wide range of architectural tasks and features manifold representational techniques. The book presents around 100 of the collection’s highlights from five centuries, arranged by category for direct comparison. All plans are depicted entirely in color on large-size spreads and fold-outs. Full catalog details and a detail in true size are provided for each drawing. Mario Carpo, Hermann Czech, Tom Emerson, Philipp Esch, David Ganzoni, Uta Hassler & Daniel Stockhammer, Ákos Moravánszky, Urs Primas, Kornel Ringli, Stephan Rutishauser, Jonathan Sergison, and Philip Ursprung contribute essays on various aspects of the topic. is an architect and an associate with Annette Spiro’s Chair of Architecture and Construction at ETH Zurich. , born 1972, studied architecture and did his PhD at ETH Zurich. He works with a Zürich-based non-profit organization for real estate management and as a freelance architectural publicist. is a professor for Architecture and Construction at at the Swiss Federal Institute of Technology Zurich (ETH Zurich).